SPECIAL = Get a Free Youth MX Goggles / Free Youth MX Gloves! A $59-value, All 3 FREE with purchase of this ATV! - Limited Time Special! THE COOLSTER 70cc MOTORCYCLE IS A VERSATILE OFF-ROAD BIKE WITH A LOW SEAT HEIGHT, SMOOTH SUSPENSION AND A SEMI-AUTOMATIC TRANSMISSION which is EASY TO LEARN ON and RIDE. Sporty styling featuring many colors and cool bodywork for a race-inspired sporty look. the engine is tough enough to pull loads over 100 pounds at speeds up to 34 miles per hour! 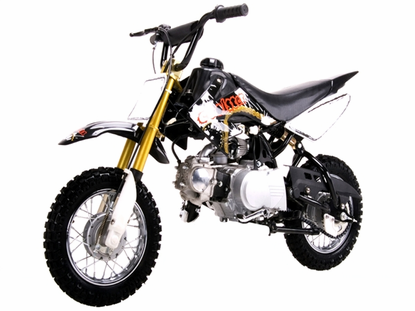 The Coolster 70cc Mini Dirt Bike contains a 4-stroke, single cylinder 70cc engine with a top speed of around 34 MPH. It is available in black, blue, orange or red colors. It features a semi-automatic transmission with front and rear drum brakes, and front steel forks, with rear mono shock suspension. The Coolster 70cc 4-Stroke Dirt Bike. 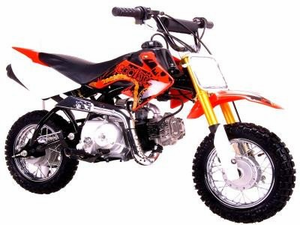 With a powerful 70cc 4 stroke engine, this dirt bike can conquer even the most rugged terrain. The handlebars may be adjusted forward or back for your comfort. The muffler is located out of the way so the rider doesn't come into contact with the hot parts. These features make this a perfect choice for the younger off-road rider or the demanding hobbyist. Best buy in a 70cc dirt bike. EPA Certified & C.A.R.B. Motobuys is proud to announce our new FULLY ASSEMBLED - READY TO RIDE OPTION! Let the pro's assemble your new Dirt Bike, it will arrive to your door built right, run tested and ready to ride. The only thing you do is 1. Hook up the battery, 2. Put gas in it and go riding! 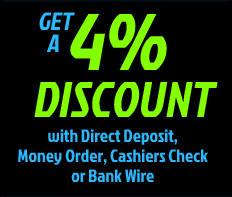 MOTOBUYS has parts for everything we sell & we provide you full TECH SUPPORT from the best trained CERTIFIED TECHS!